To look into the clear golden amber eyes of Chesapeake Bay Retrievers is to behold true intelligence. Read on to learn more about these most excellent bird dogs. It shouldn't be a surprise that Chesapeake Bay Retrievers are among the most hardy of the sporting dog breeds. After all, these retrievers were developed in the icy Chesapeake Bay region for which they were named. These dogs were designed to retrieve waterfowl from the icy water, without a care for the blustery conditions. They will actually break through the ice without a second thought and seem equally at home on land or in the water. Chesapeake Bay Retrievers are solid, sturdy dogs, slightly longer in body than they are tall. The depth of the chest should extend to the elbow, or slightly below. The head of both sexes should be broad, with a somewhat domed top skull, short ears, and trademark clear yellow/amber eyes. Chesapeake Bay Retrievers are extremely intelligent and happy dogs. The true Chessie is full of heart, quite courageous, and ready to hit the water on command. In fact, a love of the water is a definite hallmark of the breed. Chessies are also quite levelheaded and calm by nature, making them good companions whether in the field or in the home. Like so many other purebred dogs, Chessies face their share of health issues. In an effort to identify and work toward irradicating genetic problems in the breed, the American Chesapeake Club has taken a health survey amongst registered breeders. Canine Hip Dysplasia- A degenerative joint disease. Canine Epilepsy- A seizure disorder. Cancer- A well known, terminal disease that appears to cross all species lines. Presently, conscientious breeders are working to identify potentiall affected animals and remove them from their breeding programs. These wonderful dogs are true-blue companions, however, their size and athletic nature requires an outlet. Caring for a Chesapeake includes giving it plenty of physical exercise and mental stimulation as well. Without it, these otherwise intelligent, even-tempered dogs will suffer from boredom. Apartment living is also not the ideal situation for a Chesapeake Bay Retriever, whose greatest love is to be in the field or the water. If you can't provide your pet with plenty of blue skies and fresh air, it would be better not to own a Chessie. Chesapeake Bay Retrievers for Me, a listing of breeders, and other Chessie info. 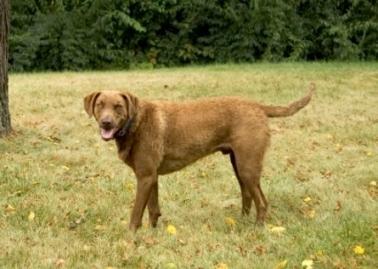 Chesapeake Bay Retriever Relief and Rescue, adopt a Chessie.